Spanish scholar and scribe of the thirteenth century. He wrote a Spanish treatise on the preparation of gold-foil and colors for miniatures; also a treatise, probably in Hebrew, on the Masorah and on the crowned letters in the scroll of the Pentateuch (De Rossi, "Cat. Parma," No. 945). 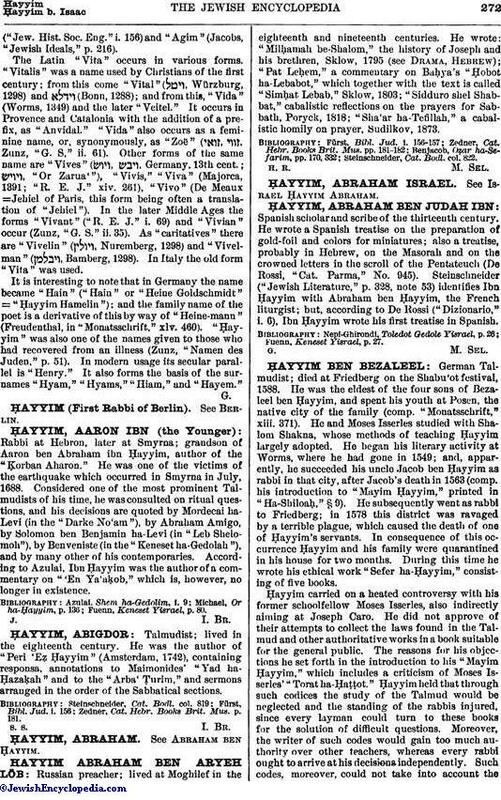 Steinschneider ("Jewish Literature," p. 328, note 53) identifies Ibn Ḥayyim with Abraham ben Ḥayyim, the French liturgist; but, according to De Rossi ("Dizionario," i. 6), Ibn Ḥayyim wrote his first treatise in Spanish.